Great news! OG’s Speculative Fiction, Issue 25 has been released! In Lawrence R. Dagstine’s “The Girl Who Dreamt Portals” a young girl is far more than the other girls at her orphanage think. In Desmond Warzel’s “Assumption” an interstellar rescue team has more adventure in store for them than they had planned. 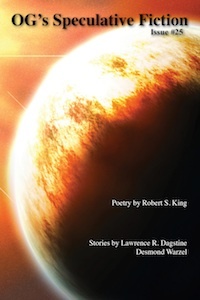 Also included is poetry by Robert S. King. Let us know what you think of the issue! Don’t miss our other issues of OG’s Speculative Fiction if you haven’t read them.